The One Read Program at the University of Missouri and the community-wide read of my novel, “The Tortilla Curtain,” was exemplary. Not only was I able to meet such a large group of enthusiastic readers personally, but I was able to explore the state a bit too. It is always an honor to be chosen for such a program, which allows readers to discuss and argue over a single text rather than the more usual (and, sorry to say, banal) TV shows and movies. In honor of our 10th anniversary, we’ll be featuring the words of authors and speakers from past years’ programs. Thank you to our task force, reading panel, discussion leaders, panel participants and community of readers – your support is what makes this program great! In this explosive novel, T. Coraghessan Boyle explores an issue that is at the forefront of our political arena. He confronts the controversy over illegal immigration head-on, illuminating the people on both sides of the issue, the haves and the have-nots, through a poignant, gripping story. In Southern California’s Topanga Canyon, two couples live in close proximity and yet are worlds apart. High atop a hill overlooking the canyon, nature writer Delaney Mossbacher and his wife, real estate agent Kyra Menaker-Mossbacher, reside in an exclusive, secluded housing development with her son, Jordan. The Mossbachers are agnostic liberals with a passion for recycling and fitness. Camped out in a ravine at the bottom of the canyon are Cándido and América Rincón, a Mexican couple who have crossed the border illegally. On the edge of starvation, they search desperately for work in the hope of moving into an apartment before their baby is born. They cling to their vision of the American dream, which, no matter how hard they try, manages to elude their grasp at every turn. A violent chance encounter brings together Delaney and Cándido, beginning a chain of events that culminates in a harrowing confrontation. The novel shifts back and forth between the two couples, giving voice to each of the four main characters as their their worlds collide and their lives become inextricably intertwined. The Rincóns’ search for the American dream, and the Mossbachers’ attempts to protect it, comprise the heart of the story. In scenes that are alternately comic, frightening and satirical, but always all too real, Boyle confronts not only immigration but social consciousness, environmental awareness, crime and unemployment in a tale that raises the curtain on the dark side of the American dream. -From a Reading Group Guide, Courtesy of Penguin Putnam, Inc.
T. Coraghessan Boyle, "my friends call me Tom," was born December 2, 1948 and grew up in Peekskill, New York. He went to the State University of New York at Potsdam to study music (he played the saxophone), switched to a History and English major and found himself drawn to writing after "wandering into a creative writing class in his junior year." For four years, he taught at his alma mater, Lakeland High School, until his story, "The OD and Hepatitis Railroad or Bust," was published in the North American Review. He won acceptance at the University of Iowa Writer’s Workshop in 1972. He received his M.F.A. in 1974 and his Ph.D. in 19th Century British Literature in 1977 from the University of Iowa. In 1977 he received a grant from the National Endowment for the Arts. He has been an English professor at University of Southern California since 1978, and established their Creative Writing Program. He has written sixteen books and won the PEN/Faulkner Award for "T.C. Boyle Stories, the Collected Stories" in 1999; for best novel in 1988 for "World’s End"; O. Henry Awards in 1989, 1999, 2001 and 2003; was a National Book Award Finalist for "Drop City" in 2003; awarded the Prix Medicis Etranger (Paris) for the best foreign novel of the year in 1997 for "The Tortilla Curtain"; and received the New York Times Book Review Editors’ Choice 1989 for "If the River Was Whiskey." His latest books are "Inner Circle" (2004), "Tooth and Claw" (2005) and "Talk Talk" (July 2006)." 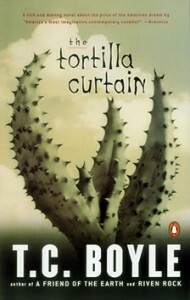 The book "Tortilla Curtain" is currently being made into a movie. To have a book chosen for a community read is nirvana for any writer and I am pleased and honored to have been selected for Columbia’s program. What most impresses me about the program is that everyone in the community will have a book in common to discuss, a rarity these days. Yes, we can talk about the latest films or TV shows, even sports and politics, but we all read so disparately that it is difficult to find someone with whom to discuss a book. I look forward to coming to town and entertaining all the readers of The Tortilla Curtain–and look forward too to the debates and discussions to which this very provocative book will necessarily give rise. –From Carlsbad City Library, CA, "Carlsbad Reads Together" resource guide.